In an age of hybrid tech teams and converging AV and IT, who should manage huddle spaces? Huddle spaces can offer the best of both worlds—useful tech and scalability—but who is in charge of maintaining them? AV teams, IT teams, or both? A TEKVOX UltraHD Quadview Classroom has been delivered, installed, and is fully operational at Lone Star College in Houston, Texas. 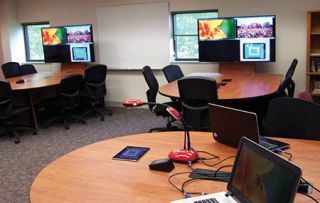 The college’s Tomball Campus is the inaugural customer for the huddle-style collaborative classroom solution, and plans call for more UltraHD Quadview Classrooms. But ask Rob Houston, product manager, Unified Communications, Biamp Systems, who gets the huddle space management duty, and his answer depends on if the rooms are currently tech-enabled (then it could be IT or AV managing them) or are simply meeting rooms with a phone and display (could be facility management). “In terms of who would drive decisions around design and implementation of technology solutions for [huddle] rooms, it also will vary among IT (with the idea that these rooms extend the end-users’ desktops) or among AV (adding huddle rooms to their work supporting board rooms, conference rooms, etc. ),” Houston explained. The size, user profiles, and preference of the company or university will drive the issue, Houston contends, so it is important that “AV works in partnership with an organization’s IT department,” taking the best advantage of everyone’s core competencies and expertise. This contrasts with observation of Robert Detwiler at InFocus. As he opined: “We’ve found that most often the IT team manages huddle room tech, or even the team who uses the space most often.” Because IT and AV can’t or shouldn’t always be involved, he said that, first and foremost, the equipment needs to be so easy to setup and use, that interns, new users, accounting, HR, and or marketing employees should all be able to use it. Simplicity and user training will help to decrease the number of problem tickets for every help desk. Barco’s David Fitzgerald, vice president of Channel Sales, sees both AV and IT teams managing huddle rooms separately as well as together. “It all depends on the structure of the individual company and available resources,” he said. Barco has also seen situations when only the end-users are managing the huddle room. Indeed, while it depends on the company, sometimes end-users are managing the rooms themselves with little involvement from either IT or AV, observes Maria Porco, VP of Business Development for X2O Media, a Barco company. “IT/AV would be smart to get ahead of users and implement reliable, lowsupport solutions,” she said. Ultimately, the use of a huddle room is meant for frequent, spontaneous meetings, so whoever is in charge of the design and installation, it’s critical to equip them and prepare them for as little intervention as possible. Epson’s Christopher Bodmer concurred, and asserted that while the AV teams are the primary owners of any audio/video solutions, IT teams play an important role when it comes to collaboration technology. “Most solutions today are connected to the network to allow both in-room and remote collaboration, hence the need for the IT team to get involved.” Overall, Goldstein emphasises that teams must work together to make a huddle space successful. Kramer’s Michael DiBella sees less and less pureplay AV teams, as they are “being absorbed into the IT departments.” Dedicated AV professionals are, of course, still recommending, testing, and implementing technology for the huddle space, but DiBella identified the fact that corporate IT groups are doing the same, or at the very least, managing AV. “For years our industry has talked about the convergence of AV over IT and that day is here,” he said. “Two of our solutions immediately come to mind; our VIA Collage runs a Windows platform and our K-Touch control is cloud-based. IT would undoubtedly need to manage both these solutions.” More products are dependent on IT-based technology for core functionality, so the shift from AV to IT management is more than just a trend for the huddles of 2015/2016. Tim Root says that many IT teams develop their own internal solutions and leverage myriad vendors. “These tend to be larger organizations that are looking to boost productivity in distributed teams.” These groups evaluate new technology in an effort to understand the limitations, so they know what needs to be addressed in the future. Why Are Huddle Spaces Trending? When talking about time and space management, which is crucial, there are two very important reasons for having a huddle room. Firstly, people don’t need to schedule meetings beforehand and, given that meetings are often seen as bad use of time, this ensures a space when needed and encourages quick and simple discussions. Secondly, they are much easier to set up and to install given their simple nature. Having videoconferencing in these small rooms is comfortable and efficient as it allows users simultaneously cooperate and share content with one another to execute collaborative work; all they need is a display installed, HDMI or VGA ports in the room, a camera for videoconferencing and availability to go wireless with their smart interfaces. With HDMI/DVI/VGA ports, it’s easy to connect laptops to displays and easily let them share content. A Duquesne University classroom after being reconfigured as a collaborative learning environment. Barco, Panasonic, and InfoFocus products were used to transform the spaces. At Duquesne University in Pittsburgh, PA, two classrooms were designated as FlexTech (Flexible/Technology) spaces. Designed as collaborative teaching and learning spaces, furnished with tables and chairs configured to allow students to work in groups. While faculty will have the option to conduct an instructor-led session, there is no “front-of-the-room,” as these spaces are designed for problem-based, workshop experiences. Barco’s ClickShare is part of the wireless real-time collaborative design. In one of the FlexTech rooms, seven tables are equipped with a dedicated computer and wall-mounted, flat-screen monitor for shared use. There is a separate, dedicated computer for instructor use, the image for which can be displayed on the groups’ flat-screen monitors. The other FlexTech space, in Rockwell Hall, is furnished with eight sets of moveable tables and chairs along with six wall-mounted, flat-screen monitors and two mobile monitors. The room also contains an InFocus Mondo pad for instructor use. The Mondo pad images may also be viewed on all group monitors. Information courtesy of Duquesne University (http://www.duq.edu/).